ConstructionManagementDegree.com recently compiled a list of the ‘Top 100 Construction Sites on the Web,’ and Green Built Blog came in at no. 1 in the Green Construction section. 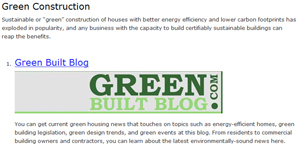 The Green Built Blog keeps consumers and builders alike up-to-date with the latest green housing news. Their articles often feature builders with green programs and incentives for green retrofits as well as information about the latest green trends and communities. ConstructionManagementDegree.com is an online resource that was created in 2010 for students considering a career in construction management. The site compiles comprehensive lists of campus and online degree information for those considering this career path as well as offering them an unbiased database to find articles, information and trends in the construction management industry. Check out the Green Built Blog online today and see why it has topped the ‘Green Construction’ section of the Top 100 Construction Sites on the Web. For more information on green Atlanta new homes, visit Atlanta Real Estate Forum. This entry was posted in Featured, Green News and tagged best green construction website, construction management degree, green atlanta new home on January 16, 2013 by Carol Morgan.